We have a running joke around here – that I get perfectly mannerly horses and ruin them. By some people’s standards that would certainly be true … and there are days that I’ll admit to wondering about it myself. Most people – vets, trainers, farriers – tend to comment on how well behaved my horses are. So, why do we have this joke that I’ve ruined them? 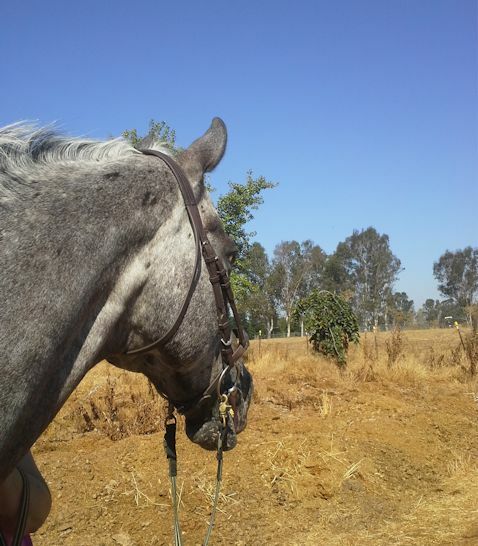 Because all of my horses freely express their opinions on many subjects … and sometimes I even listen! Nash, when we first met him, living alone and emotionally shut down. (yes, they race Appaloosas) and it clearly did not agree with him. Upon his retirement he bounced through a couple of homes in less than two years. By the time I got him, he seemed to have given up. During grooming, no part of him ever moved or reacted. He had a dull stare and didn’t even seem to enjoy his treats. 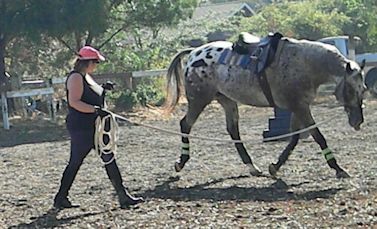 When lunging, he mechanically went through the motions, with not even an ear flick. It broke my heart to see a horse so walled off. 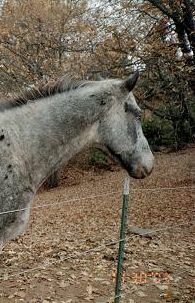 But, within a year, my farrier and veterinarian both commented on the complete turn around – his ears would prick forward upon my approach, he related to the humans around him and seemed a horse once more alive. Fast forward ten years, to today. Nash is coming off of more than a year recovering from a fractured pelvis. The year of confinement took its toll in his attitude, and I would have characterized him as slightly depressed. Things got slightly worse earlier this year, when Noble and Tally were getting my “special” attention, and my mother was doting on Coffee. Nash started being terribly cranky, aggressively lunging at the other horses who passed, and being aloof in our interactions. I’ll admit to taking a little time to figure it out, but another blogger reporting a similar situation with her two horses gave me the clue – we were spending so much time doting on the others, and taking him for granted. We started giving Nash special attention, and wham! He’s back to being charming and greeting me when I come out. Nash began his rehab with hand walks, which often included grazing, as it was Spring and grass was plentiful. As I started him actually back to work, he began to tell me that perhaps retirement was his preferred option – each time I’d turn him toward the cross-ties, as opposed to the barn door, he’d plant his feet. Unfortunately for him, at age 20 and sound as a dollar, he is not ready for retirement. This was one opinion I would ignore. Nash getting his work ethic back earlier this year. into the cross-ties. Coffee is currently just coming off of an injury, so mom and I have been sharing Nash as our only ride-able horse. On the days that I ride him, we have started a new routine – I get off and mom gets on and we all take a walk around the back acre. We have not been riding back there, as the footing is challenging; but I’m worried about him getting ring-sour, and we are surrounded by busy roads with no access to trails. So, this gives mom a chance to loosen up in the saddle, on her non-riding days, and it gives Nash a chance to loosen up from his work while getting to see what the neighbors are doing. And so we get to last night, and the inspiration for this post. I fit in a ride just before dark, since it finally cooled off and I hadn’t ridden this week. I still had to work Tally so, without thinking, I got off and we headed back to the barn. Twenty feet from the barn door Nash planted his feet. It was unlike this homebody to not want to go into the barn – after all, that’s where he would get his tack removed, and he still had a snack in his stall. Yet, he clearly had no intention of going in. I could have gotten cross, and pulled the obstinate horse into the barn. But my instinct in these situations is to wonder why the sudden difference in behavior. Nash watching the neighbors at the end of one of his walks. previously discussed that we thought Nash enjoyed our walks out back, but that’s just humans making themselves feel better. Yet, here was proof positive – he actually does enjoy those walks! And he was not about to be cheated out of one! We did not have the time, or light, to humor him, so I tried once more – but he was not to be moved. So, we stripped off the tack, put his halter on, and my mother humored him with his walk. Upon return, he happily walked into the barn and into his stall! I have worked for bosses who only wanted to hear employee input if it fit with their own views – opinions that conflicted with theirs were not welcome. Those organizations were always dysfunctional, with little to no innovation coming from the staff. In my role as a leader at work, I always welcome opinions and input – whether or not they fit my view of things. I find that it not only gives staff a voice, but it leads to the best innovations. If an employee has an idea that isn’t practical, or an opinion I don’t agree with, I explain my position. Since they know that I listen, and their ideas are just as often implemented, good will is retained. Why would I approach my working relationship with my horses any differently? By listening to Nash and trying to understand what he was telling me, I ended up with a happier horse and I learned something about him that I could only surmise previously. This entry was posted in Horsemanship, My Journey and tagged Ben, Coffee, communication, horses, listening, Nash. Bookmark the permalink.